It was really one hectic evening at home with me planning to make three different dishes at one shot. I even wanted to make use of the stove we recently got. It can be called a sigri but in actual fact a customized mini barbecue stove. Ok come to think of it, barbecue stove is also same I supposed. Anyway the fact is, lighting up the stove is really a herculean task. And Hubby dear was not prepared to do all that hard work for only vegetarian food. 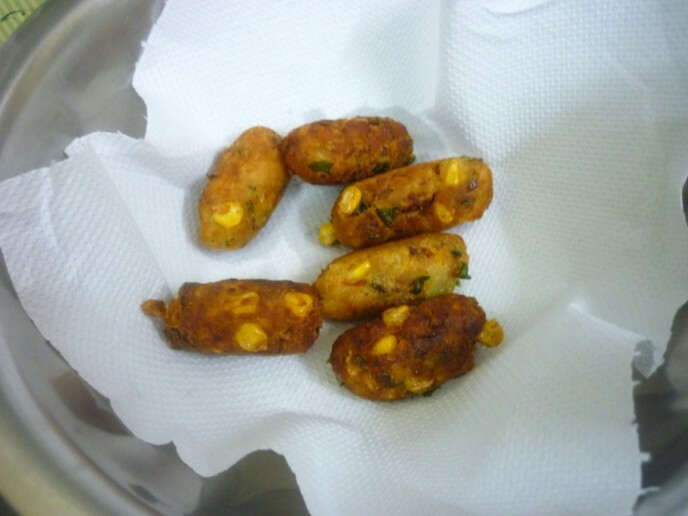 I suppose vegetarian kababs will work out easily from an oven or even stove top. Finally with so much commotion that generally happens with kids around, I decided the kababs will be made on stove top and shallow fried on top! The entire morning time was spent on shortlisting the recipes. I have a huge collection of kababs filed up, so selecting the rest of the five was not a tough part. And the fact that I wanted to try all the methods that include even shallow frying (which my dad ended up calling as cutlets) was on focus. So with the Rajmas getting soaked I was off to work. When I came back home I was wondering if those Rajmas really would boil well. Then I saw that I had used those light red variety that cooks fast. Since the recipe called for couple of other ingredients, I had to shop for them, my plan was to make at least three of them in one go. After all when I had told hubby dear that he has to light up that stove for me to make five more, he was skeptical about it, saying making kababs on daily basis is fattening! Since he was not back from work, I wanted to make sure I was done with all the recipes. Also called up Amma for her on time help and it was a big cooking process that ensued. Wash and soak Rajma overnight or for at least 8 hours. Wash couple of times and pressure cook with a pinch of salt. Once the pressure falls off, make sure the water is all evaporated. Then wash and slash on the potatoes, microwave for 5 -6 mins, soak in water and peel the outer skin. Mash well once it’s cooled. 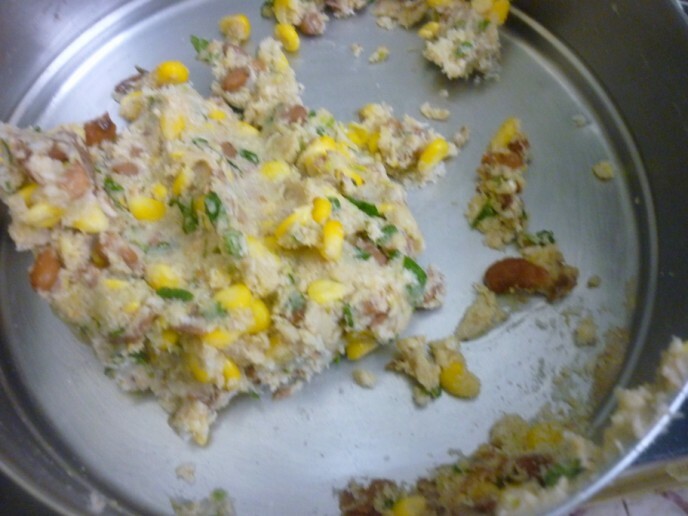 Wash and microwave the sweet corn for 10 mins. Drain the water and allow to cool. then pulse the corns coarsely. 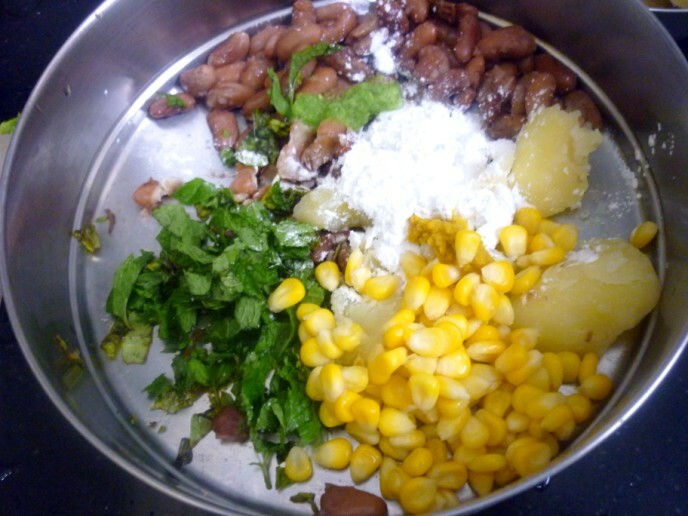 In a wide bowl, take the cooked rajma, corns, potatoes, add the paste and salt. Mix well. 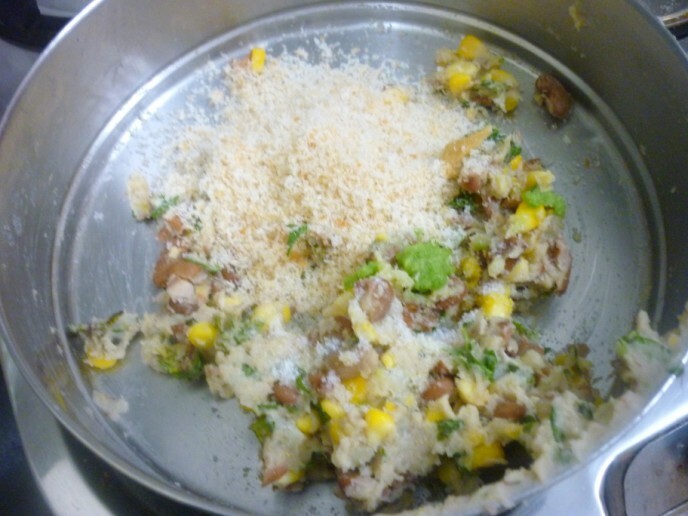 Then slowly add the bread crumbs and corn flour and make sure you have a thick dough. 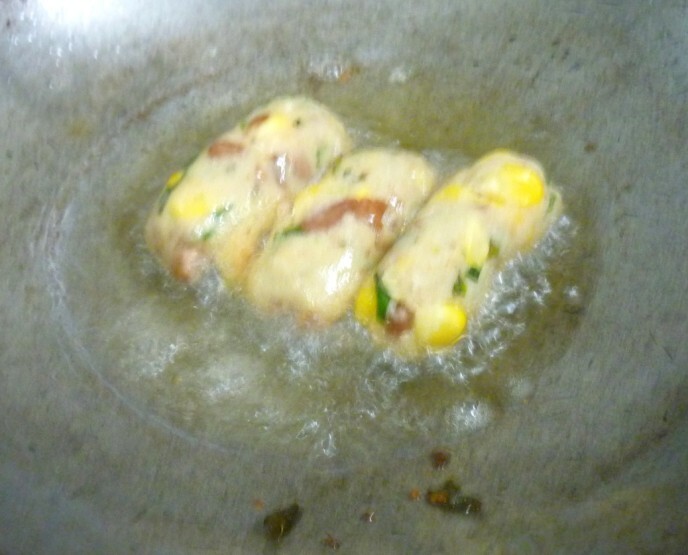 Shape them into small oblong shape, that’s typically refers to kababs. I wanted to bead them on the skewers but instead fried. Heat a pan with just enough oil for the kebabs to immerse. Fry on all sides for them to get cooked. Drain on a kitchen towel. Wash the leaves well and drain. Grind in a mixer along with green chilies to a smooth paste. Mix in lemon and salt. Adjust spice. Add water if required. First time I forgot to pulse the boiled sweet corns and had to smash with hands, pulsing should take care of that. Else you have the risk of those corns busting out during cooking process. Original recipe called for onions, jeera to be added, which were also meant to be sautéed, will be making it next time. 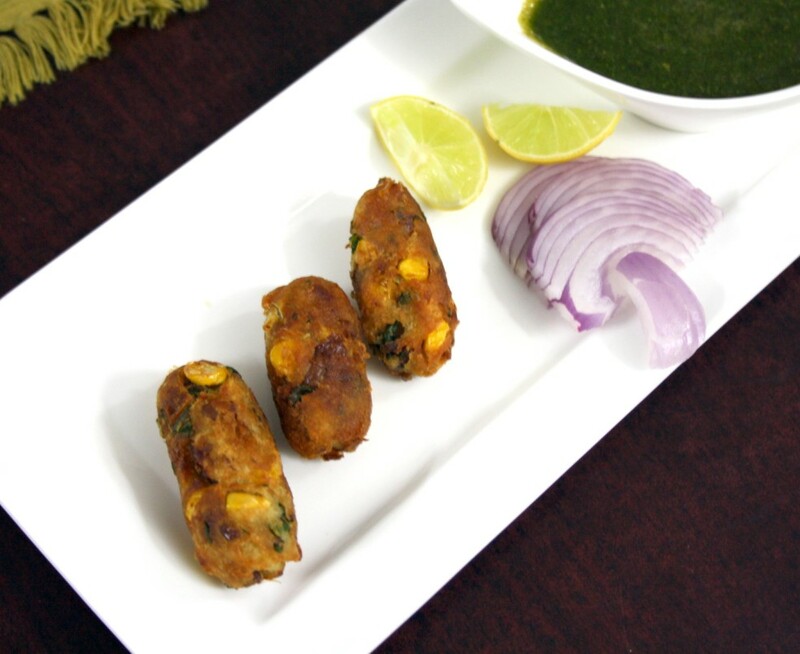 Very delicious and tasty kabab !! Mouthwatering dish ! It looks so delicious……. 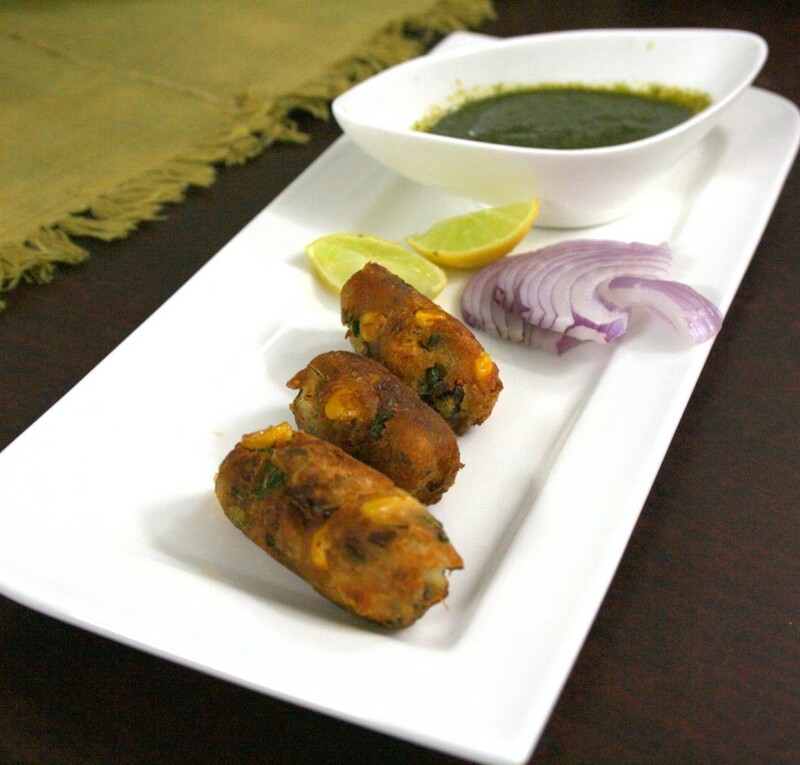 Valli..yes u shud pulse the corn..infact if u pulse raajma also u will get a better texture..n flavor too…another thing with kebabs is either chaat masala or kasoori methi..these both change the flavor tremendously.well there r sooo many options that a person goes crazy.but valli u must try the Galouti kebab..it has wonderful flavors. 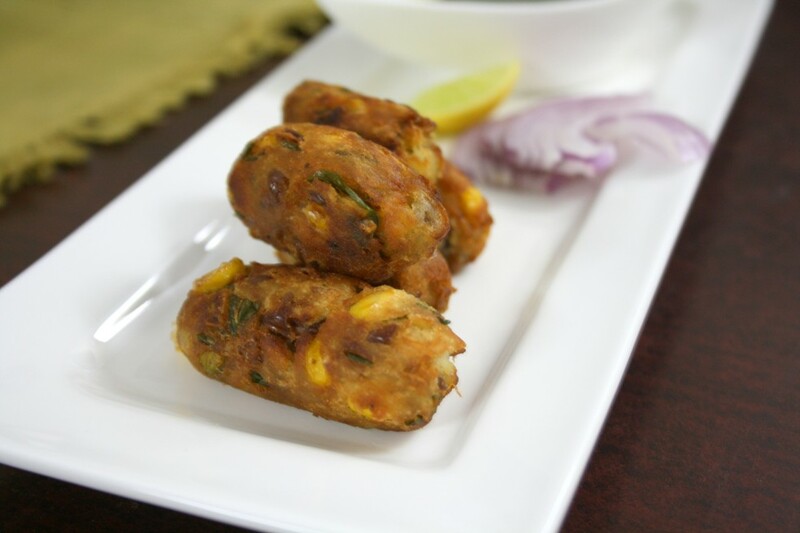 all the kebabs coming out of everyone kitchen is making me very hungry and tempting me to make them….love these corn kebabs! 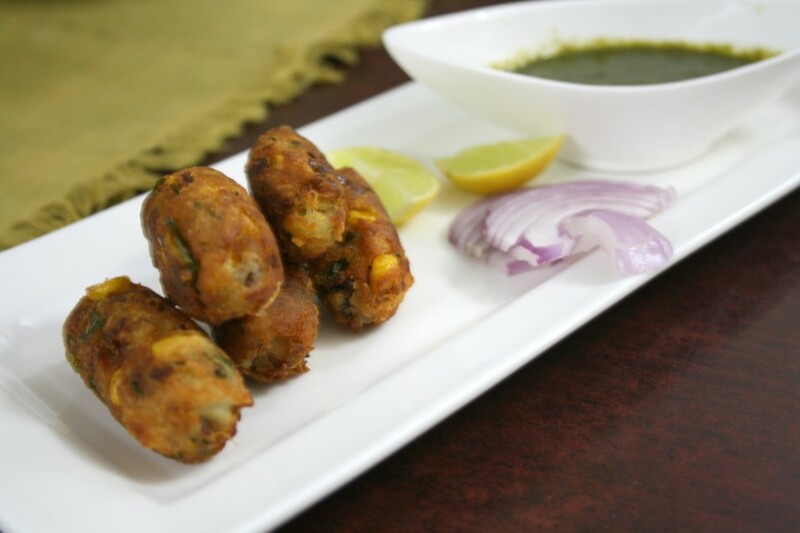 very tasty n nutritious kebab…looks inviting!! Looks yum valli!!!! Grilling might be a tough task for me (my mind block), deep frying is fine!! Bookmarking them!!!! bookmarked. definitely its worth trying out. 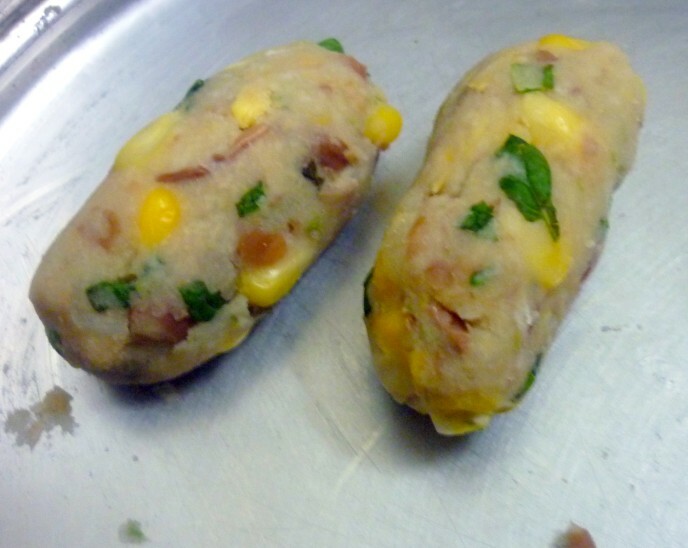 Rajma and sweet corn what a combination,kebab looks great … will try this..